San Pedro Holiday Hotel, a full service resort in the heart of San Pedro, built and owned by Celi McCorkle, an island native, the hotel sits at the intersection of most happening things on the island. 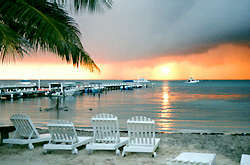 I can't think of anyone who visits Ambergris Caye who doesn't stroll the sand streets of San Pedro in the evenings. And when you stroll through San Pedro, you come to know the Holiday Hotel, its wonderful barbecues, and Celi's Restaurant. 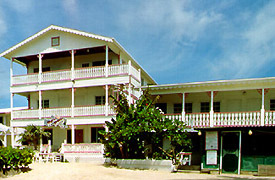 The hotel is a gorgeous colonial structure, best seen from the beach, but also has a street entrance. A three story hotel, it commands center stage in San Pedro. The seafront rooms are comfortably cooled with air conditioning and ceiling fans. You may choose to do without the AC and let the cooling trade winds add their romance to your stay. The Holiday Hotel mounts a determined campaign to make your visit enjoyable. There is a wonderful restaurant, Celi's, on the beach side of the hotel. It combines dining indoors with the outdoors. Kim and her staff can arrange everything that can be done on this island. They've been doing it longer than anyone. Between Celi and Kim, they know, or are related to everyone on Ambergris Caye! They can arrange your excursions, dives, tours of the mainland and the Maya ruins, everything! The Bottom Time is a dive shop right on the Holiday Hotel's pier, so you're just a few steps away from the most exciting diving in the world. Whether you scuba or snorkel, everything you need is right here, including courses for dive certification. There is also a swimming area for adults and children. 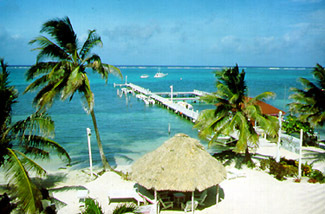 Sailsports Belize is located on the hotel's property and they offer windsurfing and sailing. The hotel also houses the Sea Gal Boutique, a beautiful lounge with big screen TV, and best of all, a Wednesday night barbecue right on their beach. Live music and spicy barbecue draws people from all over the island, and everyone's invited. Our very own Celi McCorkle was recently awarded the Minister's Award, recognizing the individual or organization that has made an outstanding contribution to the development of tourism in Belize. Click here for more information on her award. Beach Barbecue every Wednesday with live music! Glass Bottom Boat trips to Hol Chan Marine Reserve and Shark Ray Alley. Tour Desk - booking you to Maya ruins, exciting river trips, jungle excursions, caving expeditions to the mainland - literally your jumping off point for adventure. All A/C Rooms with ceiling fans, (some with refrigerators), queen and twin beds, private bath, hot and cold running water. We now offer wind surfing and sailing.